Tesla takes on the South Pacific. Eco-tourists might need to put a new destination on their bucket list: the island of Ta'u in the South Pacific. 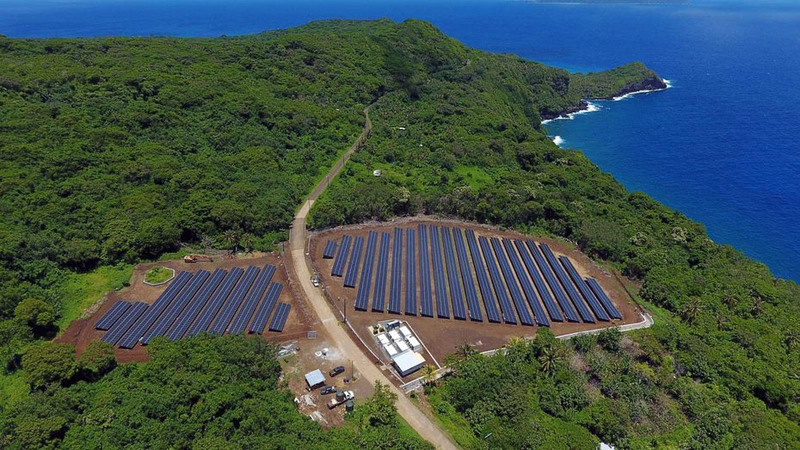 In an effort to be more eco-friendly, the island added 5,000 solar panels and 60 Tesla power packs to become entirely dependent on solar energy. This tiny island 4,000 miles off the western coast of the U.S. is home to just 600 people. Yet for years the island required 100,000 gallons of diesel to survive, according to the Independent. When poor weather conditions prevented diesel from arriving, the island practically shut down, preventing residents from getting electricity and clean water. Meanwhile, the economic cost to ship this fuel to the island became increasingly unsustainable as the bill each year stood at around $400,000. “Shipping diesel has been a long-standing environmental risk, and an inefficient use of taxpayers money,” Utu Abe Malae, executive director of the American Samoa Power Authority, told the Guardian. “We want all of American Samoa to be solar-powered by 2040—but Ta’u has been the priority and test-run,” he said. The scenic paradise is home to several natural attractions, including the Si’u Point Trail and the Luatele Crater. The former is a 2.8-mile former road in the coastal woods that runs into the Laufuti Falls. The Luatele Crater is only accessible at certain points of the year, as weather conditions can make the trail unsafe. This steep path leads from the Fiti’uta village to the crater that is home to a colony of fruit bats, according to one American Samoa website.